For the past two months I’ve been busy developing this game. There are a total of three versions of this game. Game updated to version 6. Player can now exit the machinegun and chase those sheep with a shotgun. You are in the command of a machine gun tower and you are raided by mad sheep and enemy warriors. Your mission is to shoot them down. Instructions: Aim at the enemy unit and hold down the mouse until the unit is terminated by gunfire. View older blog post or video post..
A month has passed and $0.20 money has been made. 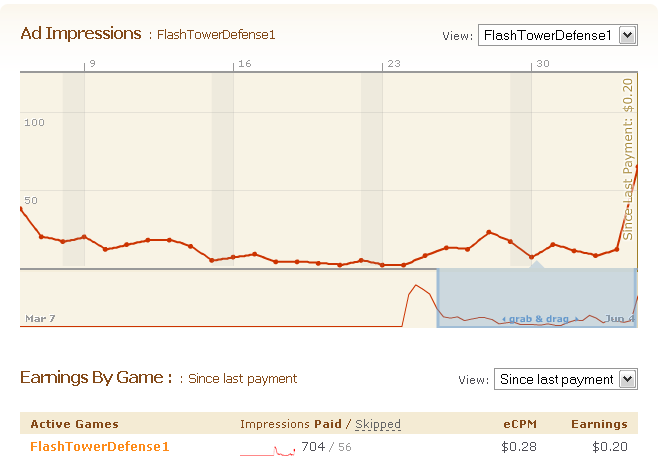 I published this project to try this new trend to monetize your flash game I’ve read about on Emanuel’s blog. My idea is simple – use c# (view source) for coding, translate the project to a actionscript equivalent via jsc and draw yourself some graphics for the game. So far so good. I am now a member of GameBalance, MochiAds and Newsground where you can even visit my profile. What do you think I should add as a next feature? I’ve already read some of the suggestions and am considering adding them. Visit older blog post here. Update: Game published on Nonoba. View my profile. Update: Game published on Multigames. View my profile. This is a simple game written with in c# with jsc for flash. It includes Mochiads. Developers can download this example project here (includes .dll and generated .as files) or just browse the source here.